The 642-832 Real Practice-Lab gives you access to a real Cisco network including Cisco 2800 series Routers, 3750 and 2950 series Switches and Microsoft Windows devices that enable you to gain hands on skills in troubleshooting Cisco Routing and Switching technologies. By completing the lab tasks you will improve your troubleshooting skills on switches and routers including common hardware resource issues on routers and switches, EIGRP, OSPF and BGP routing protocol issues, advanced switch troubleshooting techniques, Voice services including DHCP, QoS and PoE, control and data plane security and IPv6. Becoming proficient in these tasks will also help you understand the objectives and competencies required by the Cisco CCNP TSHOOT certification exam. Using the Real Practice-Lab to its full potential will help you develop your skills in becoming a highly skilled network engineer or help you develop your current skill level in troubleshooting Cisco routing and switching technologies. Once you have used the lab for either 25 / 50 or 100 hours we will acknowledge this achievement by issuing you a certificate. This can be validated by potential employers or managers alike, proving your abilities to troubleshoot Cisco networks. Advanced maintenance and troubleshooting tools: Learn advanced CLI commands, backups and archives, time-zones and event management. 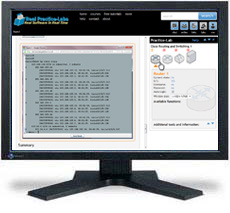 Use advanced commands and see their output in real time on real Cisco equipment hosted online in the real lab environment for your use. Switch troubleshooting: Learn how to troubleshoot layer 3 switching technologies, TCAM and Cisco Express Forwarding (CEF) problems. Routing protocol troubleshooting: Configure and troubleshoot various routing protocol scenarios using EIGRP, BGP and OSPFv3 for IPv6. Become proficient in understand of how to build and troubleshoot networks using these common industry protocols. Voice and IP services troubleshooting: Learn how to troubleshoot various IP services including DHCP, PoE, QoS which are required to support Voice networks so common in todays organisations. Security and advanced services troubleshooting: Learn how to secure the management, control and data planes of Cisco devices, including how to secure the environment from unwanted device access.